For many years, the Brooklyn Music School has struggled to stay afloat. In 2009, mounting debt almost forced it to close. But the school has survived and grown, and its mission remains unchanged: to grant access to the performing arts to anyone. 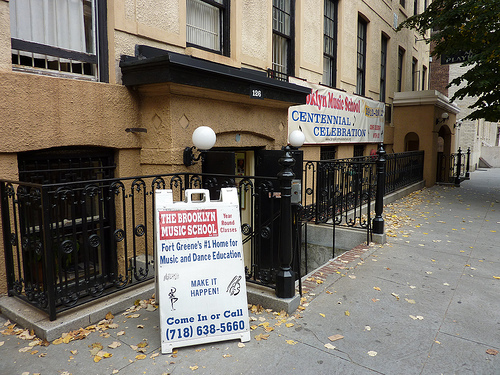 The Brooklyn Music School will celebrate its 100th anniversary in Fort Greene on Dec. 22. The school has an open enrollment policy and anyone can register at any time during the semester. Each year more than 200 local students enroll at the Brooklyn Music School to study music and dance, subjects not necessarily taught in all public schools. Yet the school struggles to maintain its independent image in an area where the Brooklyn Academy of Music is omnipresent. The school financially suffered from its anonymity in the area, but Mr. Alvarado decided to fight for this place that had welcomed so many different people over the decades. The music school was founded in 1912 “for the poor, for the blind, for the handicapped.” The fact that it welcomed marginal groups of people was the primary reason it was not used by the local community, Mr. Alvarado said. By 2009, the school was in $300,000 debt and changes had to be made. Mr. Alvarado expanded the number of after-school classes and developed a summer institute, where children learn about music and dance in the morning and go on educational trips in the afternoon. Additionally, he has improved the school’s visibility in the community by advertising the programs it offers. Mr. Alvarado also created Arts Reaching Youth, which helps children master singing and dancing at an affordable price. Lessons cost no more than $1,080 for an 18-week semester. Price can vary, depending on the subject and the length of a class. As a result of this measure, enrollment in the school has grown from 100 students a year to more than 250 for the last three years, Mr. Alvarado said. But the Brooklyn Music School isn’t just about music and dance. It also rents its playhouse to theater schools such as the Brooklyn Children’s Theater to raise the $250,000 it needs to restore the building, which dates to 1924. That involves repairing the ceiling, improving lighting and uncovering the Juliets, archways on each side of the stage named after the Shakespeare character. Ed Morrill, 60, who manages the theater, sees acting as a way for students to express thoughts and feelings, as well as to experiment with a possible future career in the arts. Amari Smith, 15, is part of the Brooklyn Children’s Theater. Every Monday evening, he comes to the playhouse to meet his friends. After a quick body and voice warm-up on stage, he becomes Rapunzel’s Prince in the musical “Into The Woods,” rehearsing the part until it is perfect. Clinton Hill resident Eva Madell is only 9 years old, but she already knows what she wants to do.